This fantastic limited edition print titled, Anzacs of Gallipoli, the Victoria Cross has to be seen and read to be fully appreciated. The 10 Victoria Crosses have been embossed and bronze foiled. The title and sub-title heading as well as all gold sections of the print have been gold foiled as well as 2 watermark images of the rising sun in the top left and right corner of the print. 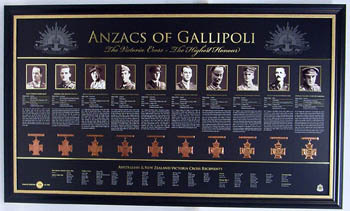 The text on the print tells the story of the 10 ANZACS who received a Victoria Cross during the Gallipoli campaign. The bottom of the print has the names of every Australian and New Zealand Victoria Cross recipient including Afghanistan but excludes Corporal Ben Roberts-Smith January, 2011 , Corporal Daniel Keighran November, 2012 and Corporal Cameron Baird February 2014 .